Enterprises grapple with a host of challenges that are spurring the creation of hybrid clouds: collections of computing infrastructure spread across multiple data centers and multiple cloud providers. This new concept often provokes uncertainty, which must be addressed head on. As more applications and computing resources move to the cloud, enterprises will become more dependent on cloud vendors, whether the issue is access, hosting, management, or any number of other services. Cloud consumers want to avoid vendor lock-in—having only one cloud provider. They want to know that they will have visibility into data and systems across multiple platforms and providers. They want to be able to move servers and storage around without a negative impact on application availability. The good news is that more solutions become available every day, but with a learning curve and numerous management challenges and considerations. 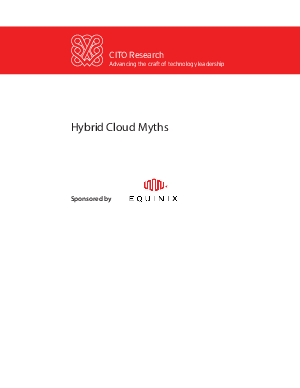 This CITO Research paper provides advice for managers about how to counter myths and misconceptions that have held back some organizations from hybrid cloud adoption.